Gentle, Mary. 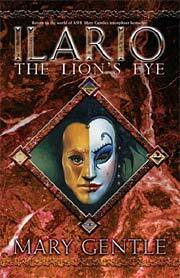 Ilario: The Lion's Eye . Gollancz 2006. What if: The Visigoth invasion of North Africa was not sunk in a storm but instead succeeded, creating an eventually powerful state centered on Carthage. Or, the Second Punic War never broke out, but instead Hannibal made peace with Rome and allied with it against the Persians. Series note: Series including, in internal chronological order, the novels Ilario: The Lion's Eye , "The Logistics of Carthage", and Ash: A Secret History . Note that the U.S. edition of Ilario: The Lion's Eye was published in two volumes as The Lion's Eye and The Stone Golem . Note that the U.S. and foreign language editions of Ash: A Secret History were published in four volumes as The Book of Ash. Comments: The two divergence dates arise because Ash: A Secret History seems to suggest the latter, Visigothic, divergence while Ilario includes a passage indicating the earlier, Hannibalian, divergence. Summary: An Iberian of dubious sexuality visits Carthage and causes a chain of event leading to diplomatic maneuvering between Carthage and the kingdom of Taraconensis with a continuing series of assassination and kidnapping attempts against him/her. Series note: A prequel to Ash: A Secret History , occurring about 50 years earlier. Published: Gollancz 2006 (0575076607, 0575076615w88 android), 2007 (0575080418BUY). — Expanded from the novella Under the Penitence , PS Publishing 2004 (190461910X, 1904619118). Awards: Finalist: 2007 Sidewise Award for best long-form alternate history. Gentle, Mary. "The Logistics of Carthage"
Series note: A novella set in The First History and occurring between the books of Ilario and of Ash . Published: In Worlds that Weren't (ed. Laura Anne Gilman), q.v. Translation: French by Patrick Marcel as "La logistique de Carthage". 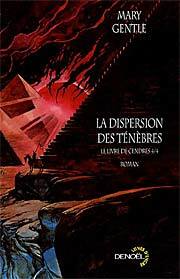 Included in Les dispersion des ténègbres: Le livre de Cendres 4/4 Denoël 2005 (2207256421). Series note: The major work of The First History; first to be published in the series but chronologically occurring last. Published: Gollancz 2000 (0575069007, 0575069015); Millennium 2001 (1857987446w88 androidBUY). — Also published in four volumes as The Book of Ash, A Secret History , Carthage Ascendant , The Wild Machines , and Lost Burgundy , all q.v. Translation: French by Patrick Marcel in four volumes as Le Livre de Cendres. Translation: German by Rainer Schumacher in four volumes as Die Legende von Ash. Translation: Spanish by Marta García Martínez and Aitor Solar in four volumes as El Libro de Ash. Awards: Winner: 2000 BSFA Award for best novel. Winner: 2000 Sidewise Award for best long-form alternate history. Nominee: 2001 Arthur C. Clarke Award. Gentle, Mary. A Secret History: The Book of Ash, #1 . Translated to the German as Der blaue Lñwe , Bastei-Lübbe 2003. 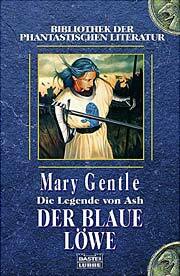 Summary: An historian translates several texts which purport to be the tale of a female mercenary commander in the late 15th Century. As he gets deeper into the story, it shifts from an historical footnote into a description of the overwhelming Visigothic invasion of Europe in 1476, with such weird elements as golems and the blotting out of the sun. Series note: First part of Ash: A Secret History . Translation: French by Patrick Marcel as La guerriègre oubliée: Le livre de Cendres 1/4 , Denoël 2004 (2207253813). Translation: German by Rainer Schumacher as Die Legende von Ash 01. Der blaue Löwe , Bastei-Lübbe 2003 (3404283384). Translation: Spanish by Marta García Martínez as Ash, la historia secreta / El Libro de Ash 1 , La Factoría de Ideas 2005 (8498001145). Gentle, Mary. 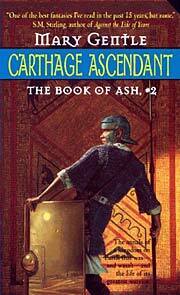 Carthage Ascendant: The Book of Ash, #2 . Avon/Eos 2000. Summary: The tale of Ash moves to the heart of Carthage when she is taken by the Visigoths and interrogated regarding her resemblance to their military commander and whether she can likewise communicate with the Stone Golem. Series note: Second part of Ash: A Secret History . Translation: French by Patrick Marcel as La puissance de Carthage: Le livre de Cendres 2/4 , Denoël 2004 (2207255805). Translation: German by Rainer Schumacher as Die Legende von Ash 02. Der Aufstieg Karthagos , Bastei-Lübbe 2003 (3404283406). Translation: Spanish by Marta García Martínez as Cartago triunfante / El Libro de Ash 2 , La Factoría de Ideas 2005 (8498001412). Gentle, Mary. 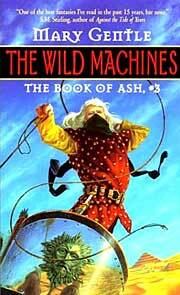 The Wild Machines: The Book of Ash, #3 . Avon/Eos 2000. Summary: Having escaped Carthage, Ash returns to Burgundy to find out why the wild machines want it destroyed, and finds Dijon under siege and its duke on his deathbed. Series note: Third part of Ash: A Secret History . Translation: French by Patrick Marcel as Les machines sauvages: Le livre de Cendres 3/4 , Denoël 2004 (2207255832). Translation: German by Rainer Schumacher as Die Legende von Ash 03. Der steinerne Golem , Bastei-Lübbe 2004 (3404283430). Translation: Spanish by Marta García Martínez as Las máquinas salvajes / El Libro de Ash 3 , La Factoría de Ideas 2005 (8498001641). Gentle, Mary. Lost Burgundy: The Book of Ash, #4 . Translated to the French as Les dispersion des ténègbres , Denoël 2005. Summary: The importance of Burgundy's existence is explained, as are how clues of the alternate history of this "lost" world became a secret history of ours. All comes together at the end. Series note: Fourth part of Ash: A Secret History . Translation: French by Patrick Marcel as Les dispersion des ténègbres: Le livre de Cendres 4/4 Denoël 2005 (2207256421). Translation: German by Rainer Schumacher as Die Legende von Ash 04. Der Untergang Burgunds , Bastei-Lübbe 2004 (3404283457). Translation: Spanish by Aitor Solar as Borgoñ perdida / El Libro de Ash 4 , La Factoría de Ideas 2006 (849800165X).